Morake managed to beat her male counterparts Loyiso Gola, Mashabela Galane, Skhumba Hlophe and Carvin Goldstone. During her inspirational female empowerment acceptance speech there was twerking, laughter and tears as she took the gleeful audience, including her husband Mpho Osei-Tutu, down memory lane on her illustrious career. “I didn’t know how much I wanted it until I won it. It means a lot and I had my sisters here with me. It means a lot because it’s a new industry and it’s growing, people need to recognise that these were guys that acknowledged me,” Morake reiterated to Sowetan LIVE after her big win. Morake came dressed like a winner too. She looked gorgeous in a black gown with exaggerated shoulders and a dramatic cape. Her good friend Brenda Khambule designed the number. “Waking up this morning, I just said I need to slay, you must look amazing, because I wasn’t expecting to win tonight. My stylist Brenda Khambule said to me I have this vision and I said show me this vision because I have a design in mind too. So she showed me this number with epaulettes and epaulettes are very important to me because they remind me of my mother, God rest her soul. I channel her every time I perform,” Morake pointed out. Starting this month, Morake will for the first time embark on a nationwide tour to promote her stand-up comedy. “There are people who have heard of Tumi Moraka, there are people who have seen Tumi Morake from OPW (Our Perfect Wedding), but they don’t know Tumi Morake the comedian. They are finally going to meet her,” Morake excitedly shared. 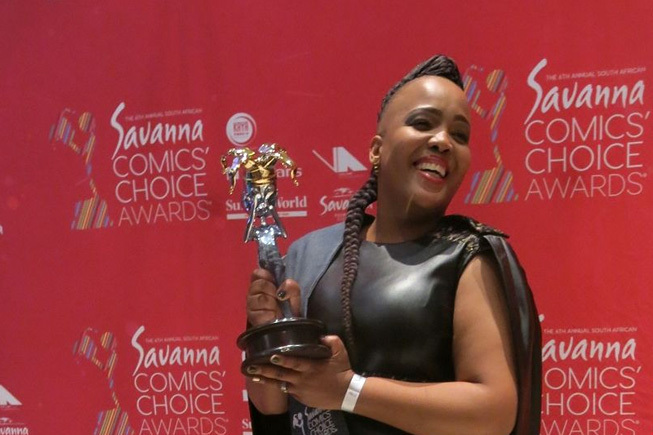 Aside from Morake’s momentous win that happened at the very end of the show, the 2016 Comics’ Choice Awards were an all boys club; with Galane, Kagiso Lediga, Hlophe and Ebenhaezer Dibakwane winning in their respective categories.